Millions of students can’t reach the global knowledge and resources that e-Learning can provide. The C3 Micro-Cloud changes all that – anytime, anywhere. 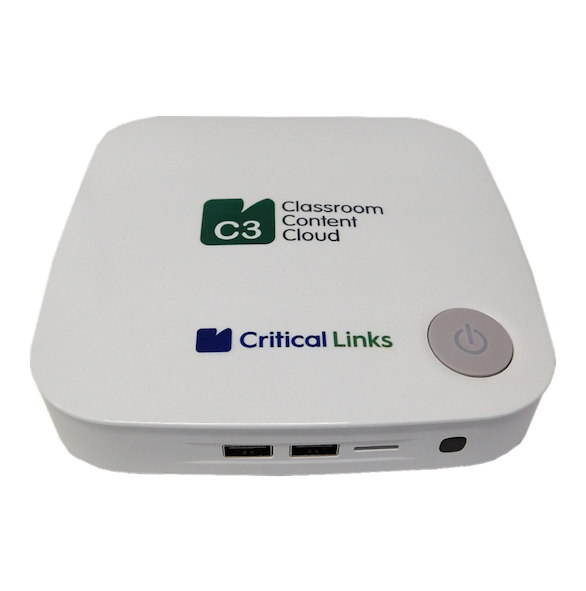 The Critical Links C3™ (Classroom Content Cloud) is a self-contained, cloud-enabled e-Learning platform that can dramatically simplify the delivery of digitized content to schools. Everywhere. 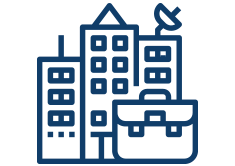 Irrespective of the constraints on internet connectivity and power, availability of technically skilled personnel, school location (urban or rural), or the specific student devices. Plug-and-play micro-cloud solution with powerful tools and possibilities. Wi-Fi Access Point functionality to allow easy connection to locally cached resources. 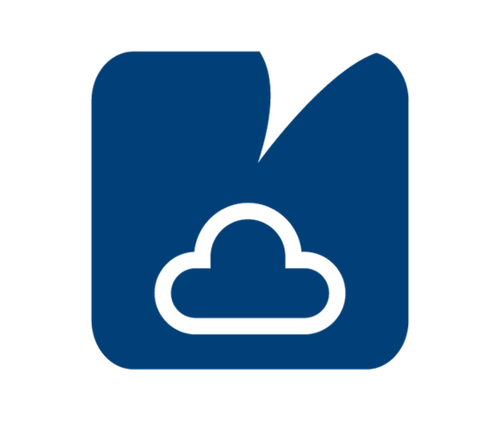 Access your digital content instantly from a local repository. Manages your Internet Access by profile, giving the right permissions to students and teachers. Improve your internet speed by caching HTTP and HTTPS pages and prioritizing access by user profile. 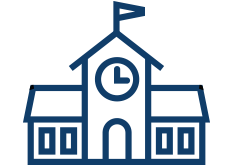 Manages content and configuration of hundreds of schools from a central location. Works across all educational environments (urban, remote, private and highly secure) regardless of location. 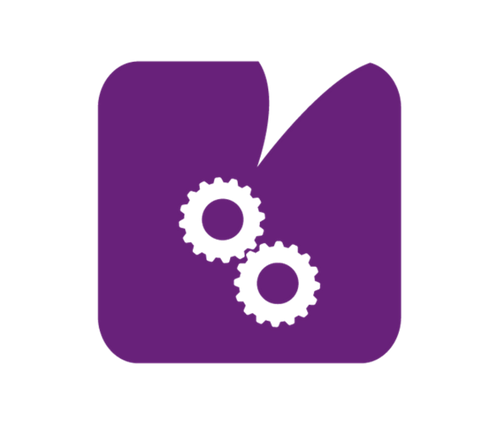 Compatible with any student device (notebooks, desktops, tablets, mobile phones, etc). 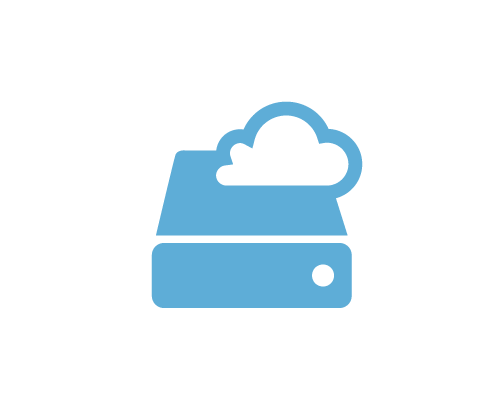 Can be deployed either as an appliance, or as a software build for customer-provided servers that meet the required specifications. 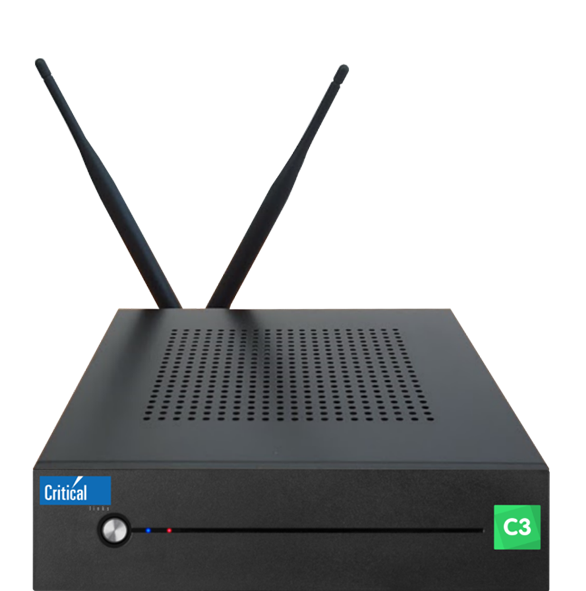 However, the C3 solution is normally delivered in an appliance footprint for ease of deployment and use. 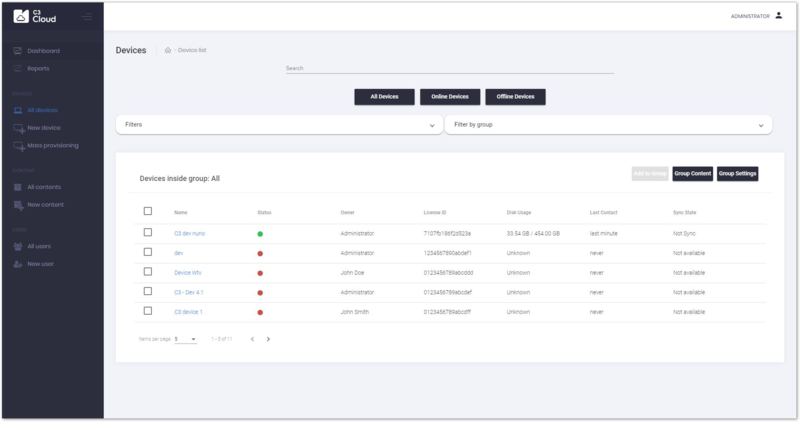 The C3 Cloud Control provides a centralized, cloud-based portal for the creation, selection, curation, and distribution of content that can easily be distributed to authorized C3 Micro-Cloud instances all over the world. Content can be either original content, or that acquired from third-party sources. Examples would be subject texts, e-books, research papers, etc. In addition, content can be selected from either HTTP or HTTPS websites (with applicable permissions) to enrich the materials and resources used in the e-Learning process. 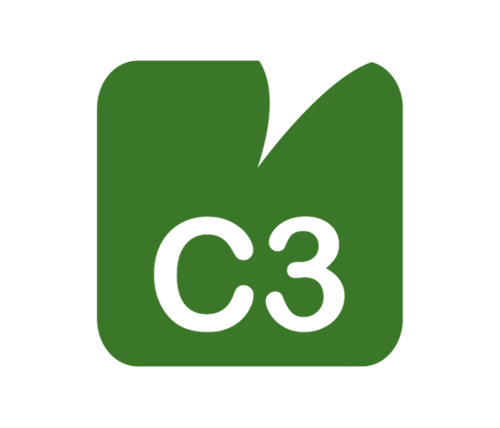 Once content is selected, the centralized administration can package and upload this to the C3 Cloud Control repository. Further, different packages can be defined based upon the type of school or classroom, yet still centrally curated and managed. 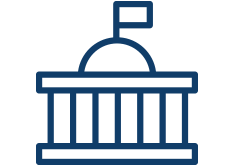 This centralized paradigm isn’t just for content, but for systems-level management, security policies, etc. Whenever a connection is available from a local C3 Micro-Cloud, it can check for updates, new content, etc. 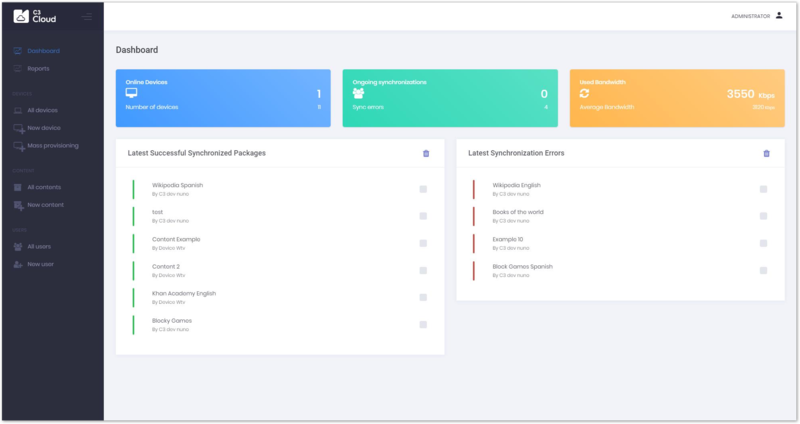 This allows an entire region to change/edit the content any time, anywhere, and know that it will sync whenever the micro-cloud next connects. A basic Learning Management System (LMS) is essential in the e-Learning process, both for teachers and students. 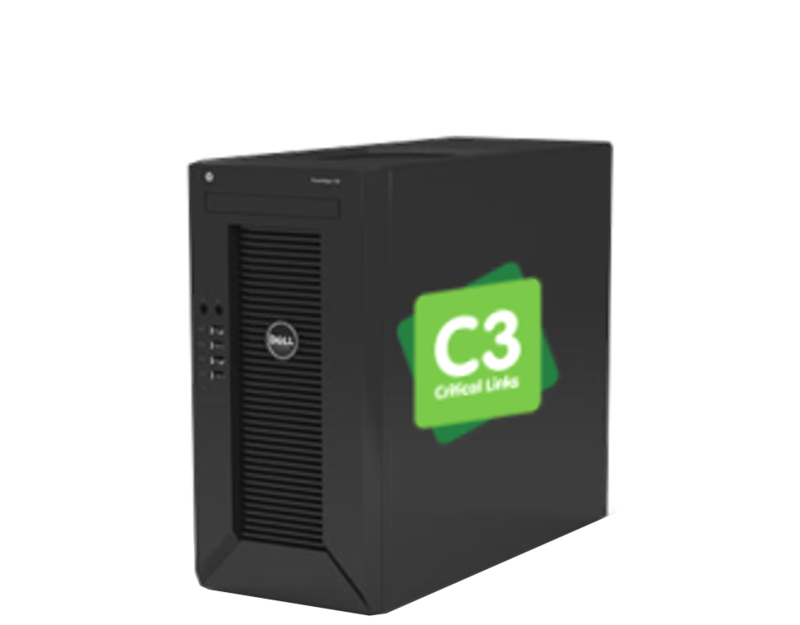 Also, for more advanced/complex environments, the industry-leading Moodle LMS is also provided with each C3 Micro-Cloud. 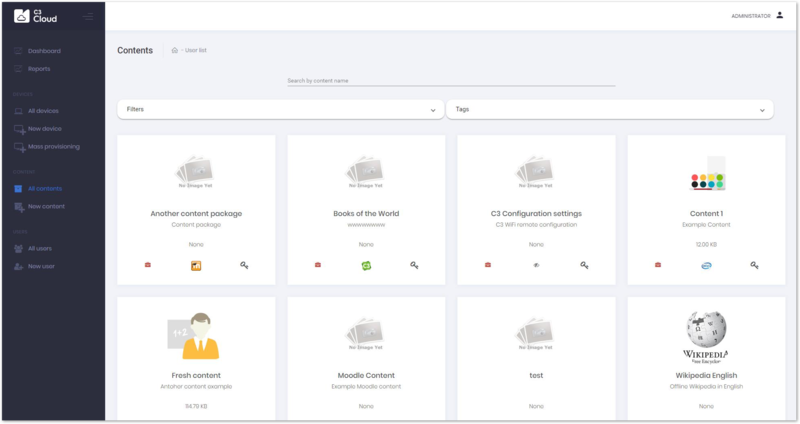 Both Foundation LMS and Moodle LMS can be managed from the central C3 Cloud portal, and leverage centrally curated content and policies. For Teachers, an LMS provides a way to organize content, give out assignments, and track results. It has become an essential tool in class planning and execution. For Students, the LMS is also key, as it’s their constant guide through the learning process as to what is their next step, what resources are available to assist in their learning experience and to keep students and teachers ‘in sync’ with regards to the digital learning process.